104 going. 46 spots left. Tickets - I'm going. Getting my tickets now. make a donation to Warbirds of Glory! 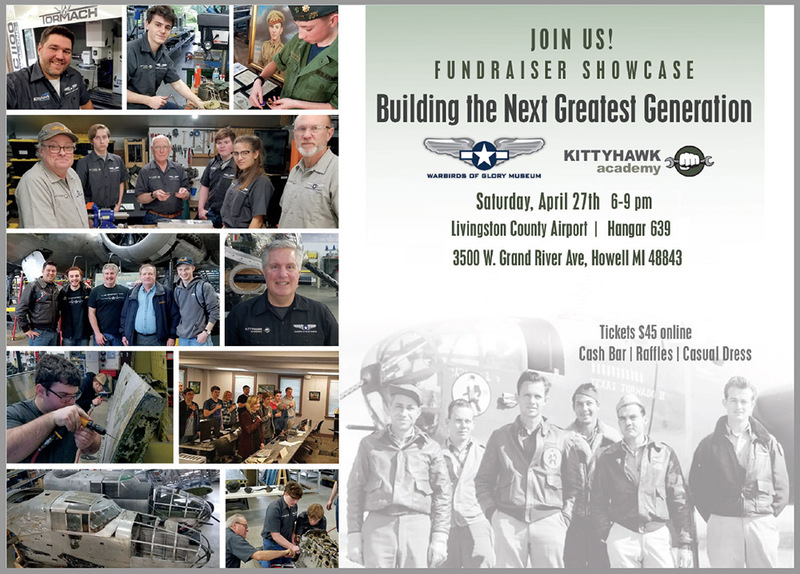 The Warbirds of Glory Museum and Kittyhawk Academy request the honor of your presence at our Fundraiser event at the Livingston County Airport in Howell. You are invited to come and tour the progress of Sandbar Michell, our WWII B-25 bomber restoration that will include sections of the actual aircraft as well as exhibits and displays of our progress. Enjoy viewing artifacts and memorabilia from pieces of our past in honoring our greatest generation, including a special honor of the crew of the B-25 8Z from the 488th BS that was shot down over Italy. Our fundraising showcase highlights Kittyhawk Academy. Experience demonstrations and Interact directly with students and mentors to learn why the Kittyhawk Academy program is so popular in developing our next generation with workshop skills, mechanical abilities, and an interest in the trade skills. •	Raffles and silent actions. •	Direct giving via donation card. •	Raise your paddle for Kittyhawk Academy scholarships. •	Donations to the Student Tool Reward fund. Space limited to 150 guests. and 5 other anonymous guests.